CITT/ICTS is a national arts service organisation that actively promotes the professional development of its members and works for the betterment of the Canadian live performance community. We are currently seeking an exceptional person who will share our mission and contribute to the growth of the organisation. - be present during the annual events and ensure the smooth operation. - a pleasant office with large windows and views of Montreal at the limits of Mile End and Le Plateau neighbourhoods, near various services and transportation. - can travel outside of the province of Quebec. Deadline for applications: is Wednesday, August 17, 2016. Start of employment: is August 29, 2016. Do you recognize yourself in this description? so that we can get to know you better. Deadline for applications is Wednesday, August 17, 2016. Start of employment is August 29, 2016. 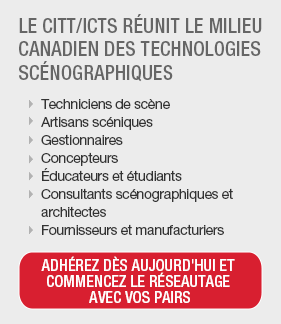 CITT/ICTS connects the Canadian Live Performance Community and serves Technicians, Craftspeople, Managers, Designers, Educators and Students, Theatre Consultants and Architects, Suppliers and Manufacturers.